This is a theme that’s very flexible. In fact, it was built for the purpose of building an online site for displaying video. This might be the right video theme for you. It allows you to create a web-based portfolio for your videography or curate a video collection. When setting up your site you have many chances to add your own flavor. That’s via several layout options that help to design a one-of-a-kind presentation style. Another feature is the unlimited combinations of color schemes that are available. This helps each site built using a VideoTouch theme to be unique. Vidiho uses the native functionality of WordPress to make video embedding easier. The homepage has a big slider that’s optimized for high-definition video. The theme also includes an option for standard blog posts for web pages that lack videos. There’s also many sharing tools.If you’re looking for a WordPress video theme this is definitely one of the best options if you’re looking for the top ones of 2017. Here’s another great WordPress video them for 2017. The goal is to function as a versatile WordPress theme that can build several kinds of video-based sites. In fact, it can be used for various applications including a home for clips, video blog, or online portfolio for videos. A key feature of this video theme is that you have several options. There’s full support for importing content from sites like Vimeo, YouTube, and Facebook Video quickly and easily. You can also host your own video content then embed the file into posts/pages. This is one of the top WordPress video themes and can be utilized for several different projects. Let’s say you’re posting vlogs, building a website, or creating a website like a video news/magazine. In that case, Vlog has just about everything you need for the process. A key feature of Vlog is that you can get set up super quick through various modern demos. The demos are designed for solo vloggers who want to promote themselves or products/services on the Internet through video. It’s also perfect for someone who wants to build the content site for multimedia video. Why should you consider this video theme? It provides you with 10 homepage designs that you can select from when you pick a video website. A few clicks are needed to import the designs to your WordPress site. This helps you to launch the new site quickly. You can also view the 10 homepage demos to learn about each theme. The theme’s developer swill then provides a BeTube setup for free. It’s one of the key benefits of this video theme. This video theme has a design and layout that makes it an excellent chance if you want to use WordPress to build a video website. Video World provides the choice to use the default layout for building a homepage that’s full of videos. When visitors arrive at your site they can look at the featured videos. Then they can scroll down to filter content by different criteria like category. The Cohhe team built this video theme to make it easier to create a video publishing site. The theme’s default homepage layout will make it a cinch to display your top video content in one location. Each video thumbnail shows a caption, length, and play button. There’s also the number of views, likes and comments that each of the items has racked up. When a visitor to a site clicks on a video thumbnail they’re taken directly to the video or a post that includes the video. The description then loads. Snaptube includes other options such as the AdRotate plugin. It makes it much easier to show ads on your website and start earning money from content. If you want your site to include social networking you can access BuddyPress support. This WordPress video theme blends a modern design with practical features. This allows you to build an effective video website using WordPress. You can pick from tons of presentation options. This will allow you to display videos/text properly. This is delivered through customer post types from WordPress. This makes video content easy to find/navigate on the front-end, and organize on the back-end. There’s also a custom gallery post type. This can be used to build video content collections. An events custom post type is also available. This can be used for promoting other people’s events or building offline/virtual events. This is a magazine theme with a block style that’s used for various types of video-related sites including the video tutorial, podcast, video review, and video blog. The theme has unlimited color skin and dark/light color schemes. The theme includes many tools/features like custom widgets, advanced control panel, SEO, ad management, custom page templates, and cross-browser compatibility. Here’s another WordPress video theme for 2017. This is an excellent option for anyone who’s creating a video magazine site. This theme provides a modern and quick-loading design. There’s also tons of page layouts/templates you can pick from when you publish fresh content on your website. There’s also a powerful control panel for theme options. This makes the process of customizing several aspects of a website much easier. The free BuddyPress plugin provides free support. This makes it easier to add social media components to your website. So you have the option to let visitors create an account at your website. They can then start sharing favorite videos. BuddyPress’ detailed settings/controls allow you to give visitors the option to comment/discuss video content that’s uploaded to your website. 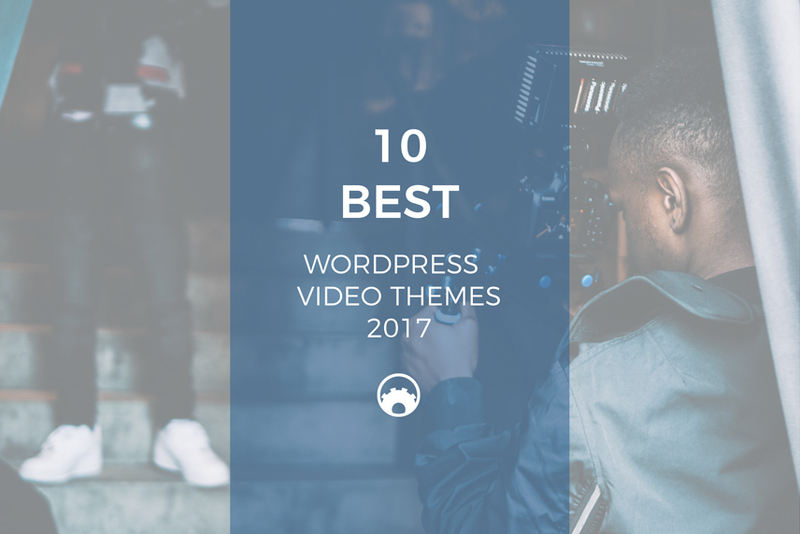 These are some of the top WordPress video themes for 2017. It’s important to consider the features, pros, and cons of each one before selecting one. That will help you to pick the best video theme for your needs. That should be your top goal.